Photo: Sand cat - Felis margarita. Click here for larger view. After spending several hours online looking for information on cats in Sudan I was surprised to find very little. There is a wonderful array of information on cats being revered as Gods in Egypt. But why not Sudan, I wonder. Do Sudanese people keep pet cats and if not, why not? I hope it is not true that some people in Southern Sudan eat cats. If anyone reading this has seen a Sand cat, or any other type of cat, domestic or wild, in Sudan or Chad, please share details here in the comments or email me at address in sidebar here at Sudan Watch. Any photos would be most appreciated. Starting today, I am taking a break from Sudan Watch to catch up on rest, reading, emails and computer housekeeping. Apologies if I owe you an email, I am doing my best to reply to all emails received. The sand cat has the appearance almost of a domestic cat albeit more muscular and obviously wilder looking. It weighs 2-3 kilograms (4.4 to 6.6 lbs). The average weight is in the order of 2.7 kg (6 lbs). Camouflaged beautifully for sandy conditions with a pale sandy coloured tabby coat, the face is noticeably broad and the ears large set on the sides of the head. The face is both sweet, wild and a little aggressive looking at the same time. In fact the skull shape is an adaptation to desert life. The skull contains a hearing structure, the bony covering of the middle ear called the tympanic bulla, that is enlarged and which is thought to be an adaptation to increase low-frequency hearing. The large ear flaps (pinnae) support excellent hearing too. Hearing is important in locating prey. Although the markings are very faint there are strong stripes on the forelegs. The density of the coat colour fades to off-white on the undersides. The fur is dense and makes this cat looking larger than is the case. Its well camouflaged body allows it to hide very effectively when threatened by crouching low to the ground besides a rock with its chin touching the ground and ears flattened to mimic the rock. An interesting feature of this cat is the thick fur that grows between its toes, which protects the pads of the paws against the hot sand of the desert. Apparently they encounter very cold conditions too so the fur insulates against cold as well. The Sand cat can move fast when required but its short legs means it moves close to the ground. Where do we find the Sand Cat? At 2009, this wildcat is known or believed to occupy: Algeria, Iran, Jordan, Niger, Pakistan, Syria, Turkmenistan, UAE, Uzbekistan, Yemen, Oman, Kazakhstan, Kuwait, Egypt, Mauritania, Morocco, Saudi Arabia, W. Sahara, Israel. It may also occupy the following countries: Tunisia, Libya, Qatar, Chad, Mali, Afghanistan, Senegal and Sudan. Sand cats have big appetites. In captivity one cat was feed 15 mice and would have eaten more if given them. Normally they eat about 10% of their body weight per night. Perhaps a good proportion of this is burned off on hunting, judging by the distances travelled to find prey. As to communication, this wildcat makes many of the sounds of the domestic cat but some are peculiar to the this cat. For example, they bark somewhat like small dogs. It is a sharp repeating call. It is used, it seems: for males seeking males; for females and males when meeting. The sand cat has a hiss that has a click attached to it. There is also a gurgle that is used when in close contact. In addition there are the usual non-vocal calls such as leaving claw marks and urine spraying. A small, short-legged animal, the sand or sand-dune cat has an unusually broad head with large ears set low down on the side of the head. The position of the ears may help it to present a low profile when stalking prey. Felis margarita is named after the French General Margueritte who explored much of what was the French Sahara. Sand cats are about the size of a small domestic cat, and very similar to the Chinese desert cat (Felis bieti). Their soft dense fur is a pale sandy brown, light grey or ochre. It is slightly darker on the back and whitish on the belly, lower muzzle and chest. There are indistinct bars on the limbs, and the black-tipped, relatively long tail has two to six black rings near the end. There is a reddish streak from the eyes across the cheeks, and the ears are rufous brown and tipped with black. Four indistinct tawny-brown stripes may mark the nape and the flanks may be marked with brownish red spots and obscure vertical stripes. A dense mat of long (two cm) hair grows between the pads of the feet. This covers the pads, protecting them against hot sand and probably is an adaptation to help spread the animal’s weight over shifting sand. The skull is notable for the large auditory bullae and long nasal bones. This suggests that they rely particularly on their senses of hearing and smell. 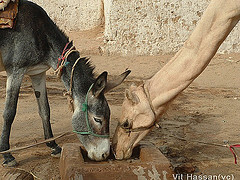 Some desert animals have large noses to help them cut down water lost to evaporation from their breath. Large noses aid condensation within, so less water is lost. Adaptations like this are extremely important for desert animals. F. m. thinobia is the largest of the subspecies and has almost no patterning at all. Individuals from the western parts of the sand cat’s range tend to be more brightly coloured and more distinctively marked. These subspecies, and those of many other animals, are often the subject of much taxonomic debate and many are disputed. "Africa is not poor, it is poorly managed." - President Ellen Johnson-Sirleaf of Liberia, 2009. The following report also tells us that Ellen Johnson-Sirleaf says she underestimated the problem of graft. Why is the African continent poor? The desolate, dusty town of Pibor on South Sudan's border with Ethiopia has no running water, no electricity and little but mud huts for the population to live in. You would be hard put to find a poorer place anywhere on earth. I went there as part of a journey across Africa to ask the question "Why is Africa poor?" for a BBC radio documentary series. I was asked to investigate why it is that every single African country - with the exceptions of oil-rich Gabon and Algeria - is classified by the United Nations as having a "low" broadly defined Human Development Index - in other words an appalling standard of living for most of the people. In Pibor, the answer to why the place is poor seems fairly obvious. The people - most of whom are from the Murle ethnic group - are crippled by tribal conflicts related to disputes over cattle, the traditional store of wealth in South Sudan. The Murle have recently had fights with the Lol Nuer group to the north of Pibor and with ethnic Bor Dinkas to the west. In a spate of fighting with the Lol Nuer earlier this year several hundred people, many of them women and children, were killed in deliberate attacks on villages. There has been a rash of similar clashes across South Sudan in the past year (although most were on a smaller scale than the fights between the Lol Nuer and the Murle). And so the answer to why South Sudan is poor is surely a no-brainer: War makes you destitute. Why is there so much war? And yet South Sudan is potentially rich. "It's bigger than Kenya, Uganda, Rwanda and Burundi combined," the South Sudan Regional Co-operation Minister Barnaba Benjamin, enthused. "Tremendous land! Very fertile, enormous rainfall, tremendous agricultural resources. Minerals! We have oil and many other minerals - go name it!" The paradox of rich resources and poor people hints at another layer of explanation about why Africa is poor. It is not just that there is war. The question should, perhaps be: "Why is there so much war?" And the headline question is in fact misleading; Africans as a people may be poor, but Africa as a place is fantastically rich - in minerals, land, labour and sunshine. That is why outsiders have been coming here for hundreds of years - to invade, occupy, convert, plunder and trade. But the resources of South Sudan, for example, have never been properly developed. During colonial rule South Sudan was used as little more than a reservoir of labour and raw materials. Then independence was followed by 50 years of on-off war between the south and north - with northerners in Khartoum continuing the British tactic of divide and rule among the southern groups. Some southerners believe this is still happening today. On my journey across the poorest, sub-Saharan swathe of the continent - that took in Liberia and Nigeria in the west, Sudan in the centre, and Kenya in the east - people explored the impact that both non-Africans and Africans had had on why Africa is poor. Almost every African I met, who was not actually in government, blamed corrupt African leaders for their plight. "The gap between the rich and the poor in Africa is still growing," said a fisherman on the shores of Lake Victoria. "Our leaders, they just want to keep on being rich. And they don't want to pay taxes." Even President Ellen Johnson-Sirleaf of Liberia came close to this when she told me she had underestimated the level of corruption in her country when she took office. "Maybe I should have sacked the whole government when I came to power," she said. "Africa is not poor," President Johnson-Sirleaf added, "it is poorly managed." This theme was echoed by an architect in Kenya and a senior government official in Nigeria. Both pointed out that the informal sector of most African economies is huge and almost completely unharnessed. Marketplaces, and a million little lean-to repair shops and small-scale factories are what most urban Africans rely upon for a living. But such is their distrust of government officials that most businesspeople in the informal sector avoid all contact with the authorities. Kenyan architect and town planner Mumo Museva took me to the bustling Eastleigh area of Nairobi, where traders have created a booming economy despite the place being almost completely abandoned by the government. Eastleigh is a filthy part of the city where rubbish lies uncollected, the potholes in the roads are the size of swimming pools, and the drains have collapsed. But one indication of the success of the traders, Mr Museva said, was the high per-square-foot rents there. "You'll be surprised to note that Eastleigh is the most expensive real estate in Nairobi." He added that if Eastleigh traders trusted the government they might pay some taxes in return for decent services, so creating a "virtuous circle". "It would lift people out of poverty," he said. "Remember, poverty is related to quality of life, and the quality of life here is appalling, despite the huge amount of wealth flowing through these areas." Then the young Kenyan architect echoed the Liberian president, some 5,000km (3,000 miles) away on the other side of the continent. "Africa is not poor," he also said. "Africa is just poorly managed." The CECAFA Under-17 youth championship organisers are in a quandary as to how to deal with the problem of overage players, as Sudan and Zanzibar have presented teams with boys suspected to be over the age limit. The organisers have been caught in a mix because documents presented by the suspected teams are official identification from their respective countries. Kenya were beaten 3-1 by Zanzibar in their opening match in Juba Stadium, while Sudan beat Tanzania 3-0 on Thursday. But according to a report posted on kenyapremierleague.com, immediately after the Sudanese match, CECAFA ruled that 17 players in the Sudan squad were ineligible and expelled them, stripping the country of their win against Tanzania. The embarrassment caused by the hosts left CECAFA with no option, but they have handed them a reprieve of sorts by keeping them in the competition, if they can raise a legal team. The Zanzibar and Ethiopian contingents in Juba are also highly suspect. Although Ethiopia were beaten 4-0 on the opening day by Uganda, the team played four players who were rumoured to be overage, while Zanzibar's 3-1 over Kenya was blighted by the presence of several older looking players in the victorious side. Twelve teams are participating in the two week championship, and it is not yet known what action CECAFA will take against teams that have already used overage players in their opening matches. So far, Tanzania and Kenya are the only teams seen as having players of the correct age. Click on label here below to view related reports. (Rumbek) – An investigation into the killing of a businessman last week in Rumbek is still underway. Omar Hassan was killed by people suspected to be criminal investigation police in Tony, Warrap State last week. Our correspondent in Rumbek, Angelo Mageng Wade Deng, sent this report. The driver of the bus in which Omar was traveling reported the case to Omar’s brother and to the police in Rumbek. The police found the body of the man in a well near a river in Tony town. Four of the criminal investigation police have been arrested and are under investigation in connection with the murder. South Sudan Gov't cannot account for $8 billion it received over last 4 years? Ahmed Ibrahim al-Tahir has urged the Government of South Sudan to account for $8 billion that it received over a four-year period. (Khartoum) – The speaker of the National Assembly in Khartoum, Ahmed Ibrahim al-Tahir has urged GOSS to account for the 8 billion USD that has been dispatched to them over a four-year period. Addressing a forum attended by representatives of oil-producing states in Sudan, al-Tahir said that development of the south is the sole responsibility of GOSS and it should be transparent in how they spend their share of the oil revenue. Sudan Radio Service asked the SPLM secretary for the southern sector, Bol Makueng, for his reaction to al-Tahir’s statement. [Bol Makueng]: “First of all that chairman [al-Tahir] does not have the interests of the people of south Sudan at heart. Secondly, it is one of their tactics to create havoc here in the south, either through militia so that there is insecurity or through media propaganda so that the country is seen as being a failed or corrupt state. They think that they have the right to do things on our behalf and then we have to account for what they do. This is not acceptable. Now the figures they are talking about are figures that when you go into details later on, you can not trace them to wherever they claim they have sent that money to. Because we don’t know how much oil is sold and how much money it sold at or how much percentage of that money is given to us. That is the paradox of the northern claims. Perhaps they have taken the monopoly of managing the oil money, so they can say anything; they can say they have given us trillions. They are always apportioning blame, apportioning anything bad to the south or to GOSS or to the SPLM." Bol Makueng was reacting to accusations that GOSS has can not account for 8 billion USD which it received over the last 4 years. Note to self. If 100 tanks were ordered by Government of South Sudan the order ought to show up somewhere in the accounts, no? Beltone Private Equity, the private equity arm of Egypt’s Belton Financial investment bank, has teamed up with Khartoum-based Kenana Sugar Company to invest up to $1bn in large-scale infrastructure projects in Egypt and Sudan, according to reports. Hazem Barakat, CEO of Beltone Private Equity, said in a statement that Beltone would provide extensive investment management, corporate finance, and strategic capabilities. Kenana will provide technical expertise for the venture. Kenana’s biggest investors are the Sudanese government, the Kuwait Investment Authority and the government of Saudi Arabia. The company was established in 1975, claims to be one of the world’s largest integrated sugar companies located on the eastern bank of the White Nile. Kenana produces 400,000 tonnes of sugar per year. Beltone Private Equity was established in 2006. As of end October 2008, the company reported over EGP1.5bn ($271m) in assets under management in a diverse range of investments. Click on label here below to view previous reports and updates. The President of the Government of Southern Sudan Salva Kirr on Wednesday opened the Cecafa Under-17 championship at a packed Juba Stadium. The championship was opened simultaneously in Juba and Khartoum, two of three cities that will be hosting the tournament. The third host city is Wadmedani. Kenya are based in Juba and were due open their campaign against Zanzibar in a Group “B” on Thursday evening while Sudan welcomed Tanzania and Somalia took on guest team Malawi in Group “A fixtures in Khartoum. The tournament is the first major sporting event of its kind to be held in Southern Sudan and involves 12 nations. “The decisive decision taken by Cecafa to have Group “A” matches played in Juba came after sending its delegations to visit the Juba Stadium and perusing security situation in the capital. The move has proven the relentless efforts and the commitment the government of Southern Sudan has exerted in providing security and development,” a statement from the Office of Vice-president, Government of Southern Sudan said about the tournament. Sudan’s Minister of Culture, Youth and Sport Gabriel Changson Chang also attended the opening ceremony. Uganda lads, urged on by a sizeable expatriate community from their country, sounded an early warning when they thumped their Ethiopian counterparts 4-0 in the opening match on Tuesday. Northern and southern Sudan have signed a deal aimed at bolstering a fragile peace accord they signed in 2005, in front of the US envoy to the country. Scott Gration said the deal, which agrees how to take Sudan to next year's election, heralded a "brighter future". But he gave few details, and analysts say it is more of a commitment to work together than a substantial deal. The two sides were at war for 22 years and have blamed each other for a recent series of deadly clashes. The BBC's Peter Martell, in South Sudan's capital, Juba, says people are in optimistic mood and are hopeful that the politicians will carry through their promises. But he says there are several issues that need to be sorted out - not least a referendum which will ask people in South Sudan if they want independence from the north. The vote is scheduled for 2011, but the exact details have already sparked controversy - with officials from the south threatening to declare unilateral independence if they believe the poll will be unfair. However, Mr Gration said the new deal engendered a "sense of co-operation" which was "a precursor of good things to come". "It will result in better co-operation and stronger relations that will result in a brighter future for Sudan, for Khartoum and Juba," he told journalists after the deal was signed. Full story: BBC News 16:19 GMT, Wednesday, 19 August 2009 17:19 UK - Sudanese foes sign new peace deal. Darfur’s Rebels Should Unite Ahead of Peace Talks, U.S. Says. Rebel movements in Sudan’s troubled Darfur region should unite ahead of talks with the government to promote a single message, U.S. Special Envoy to Sudan, Scott Gration, said. “Civil society must also speak up so that their voices are heard on issues related to land reform, elections and human rights,” Graton told reporters in the Southern Sudan capital, Juba, yesterday before heading to Addis Ababa in Ethiopia to participate in Darfur unity talks between the government and rebels groups following frequent clashes in the region. Source: Bloomberg, Friday, 21 August 2009 by Moyiga Nduru - Darfur’s Rebels Should Unite Ahead of Peace Talks, U.S. Says. (Juba) - The SPLM and the NCP signed an agreement concerning the implementation of the CPA following their third trilateral meeting in Juba on Wednesday. The US special envoy to Sudan, Scott Gration, facilitated the talks after meeting with representatives of the two signatories to the CPA in Washington D.C. and Khartoum in June and July this year. Speaking at a press conference in Juba, SPLM deputy chairman Malik Agaar said they had agreed on key aspects of the CPA implementation. [Malik Agaar]: “We were trying to reach an agreement on how we will implement the issues of the Abyei border demarcation, security, power-sharing, the two areas (Blue Nile and Southern Khordofan), elections, democratic transformation of the country, making unity attractive and Darfur. These are the issues we have now initialed following the trilateral talks in Juba." The NCP's advisor to President al-Bashir, Ghazi Salah el-Din, said that his party is still committed to dialogue with the SPLM. Scott Gration said that the two parties have yet to agree on two contentious issues. [Scott Gration]:”There are still two issues that remain to be fully worked out. They are the referendum and the census. These will be worked out both bilaterally and trilaterally in the next month to fully implement the CPA." The SPLM rejects the results of the census which indicates the number of southerners living in the north, while the NCP is pushing for a 75 percent ‘Yes’ vote for the referendum law to pass through the parliament in order for the south to be able to vote for secession or unity. They key issues the NCP and the SPLM agreed on included border demarcation and that the 1956 north-south border shall remain in place until after the results of the Abyei referendum. On wealth-sharing, the two parties agreed that GONU should transfer GOSS's share of oil revenue on time, as provided for under the terms of the CPA. On the issue of Blue Nile and Southern Kordofan, the two parties agreed to determine whether there is need for legislation to govern the process of popular consultations. The partners agreed to prepare the referendum bill for enactment by the assembly not later than September 15th 2009, and to conduct free and fair elections as agreed upon by the National Elections commission. These recommendations will be forwarded to the presidency for final ratification to commit the SPLM and NCP to implement the CPA. August 20, 2009 (KHARTOUM) — The US special envoy to Sudan Scott Gration met today with 2nd Vice President Ali Osman Taha in Khartoum and presidential adviser Ghazi Salah Al-Deen. Yesterday the assistant US Secretary of State Philip Crowley told reporters that Gration has no plans to travel to Khartoum or Darfur during his visit. Last week the head of the US bureau at the Sudanese foreign ministry Nasr Al-Deen Wali said that Gration will meet in Khartoum with Taha and then fly Juba and Malakal in South Sudan and Al-Fasher in Darfur to inspect IDP camps. Earlier today Gration told reporters after meeting with Sudan First Vice President Salva Kiir that the US is leaning towards “smart sanctions” that grants exceptions to items needed for development in the semi-autonomous South. The sanctions "have kept southern Sudan from getting the development that they so desperately need," said Gration, sitting alongside Kiir. The US special envoy in his testimony before lawmakers last month called for lifting sanctions on Sudan and removing it from the list of countries that sponsor terrorism. Gration stressed that the decision to keep Sudan on the terrorism list was “political” one and that the sanctions were undermining his diplomacy. This week the US announced that its comprehensive policy review of Sudan that will determine its conflict resolution strategy for the largest country in Africa will be completed this month. (Juba) – In a press conference on Thursday in Juba, The United States special envoy to Sudan, Scott Gration, reiterated the commitment of his government to supporting the peace implementation process in Sudan. Gration said that sanctions on Sudan should be partially lifted to improve the humanitarian situation, especially in Darfur. He said that the sanctions have kept southern Sudan from getting the development the region needs. Scott Gration was speaking in Juba during a five-day visit to Sudan. In preparation for the US chairing the UN Security Council for the whole of next month, Save Darfur Coalition aims to raise $42,000 by August 21st in order to project images of Darfur onto a building near the UN where US President Obama and other world leaders will be sure to see it. No doubt the gun toting Darfur rebel groups and their supporters will be pleased. On September 24th, the United States intends to convene a head of state-level meeting of the UN Security Council on nuclear nonproliferation and nuclear disarmament during the U.S. Presidency of the Council. The meeting will be chaired by President Obama. The Security Council has an essential role in preventing the spread and use of nuclear weapons and is also the world’s principal multilateral instrument for global security cooperation. The session will be focused on nuclear nonproliferation and nuclear disarmament broadly and not on any specific countries. Over the next several weeks, we will work closely with members of the Security Council to prepare for this important meeting. If we can raise $42,000 by August 21, we can project the powerful images of the Darfur/Darfur exhibit and mobilize activists on the streets around the U.N. Your words. Their images. One unforgettable message to the U.N. Imagine projecting this powerful message—along with the unforgettable images of the Darfur/Darfur photo exhibit—onto a building near the U.N. where world leaders will be sure to see it. Well, you and I can make it happen, but only if we can raise $42,000 by August 21. Will you help? Our window of opportunity is short. We need to secure these funds before the U.N. General Assembly this September, as this could be our best chance to focus the world's leaders on the millions of people still teetering on the edge of survival in Sudan. friend, your commitment to this campaign is what's already driving our success. Thanks to the votes of thousands of activists like you, this week we chose "Don't Forget Darfur" as the name for our all-out campaign this September. Will you go one step further and help us take your message to the U.N.? Your resolve and support couldn't come at a more crucial moment for Sudan. While millions of Darfuris continue to live in uncertainty and fear in Darfur, violence in South Sudan has sky-rocketed in recent months. If world leaders don't act now, some experts believe the rise in insecurity in South Sudan could reignite the brutal war that killed over 2 million. Your donation will support our Darfur/Darfur exhibit — as well as posters, flyers, street teams and press conferences—and could help us avert disaster by bringing the world's attention back to the fight for peace in Sudan. Through our massive display of images from Darfur, signs placed in your windows, and a global photo petition to President Obama, our "Don't Forget Darfur" campaign will make it impossible for world leaders to ignore Darfur and Sudan a moment longer. I want to thank you in advance for helping us seize this opportunity. I'll be in touch soon to let you know whether we'll be able to launch our projection this September! If we can raise $42,000 by August 21, we can project the powerful images of the Darfur/Darfur exhibit and mobilize activists on the streets around the U.N. during the upcoming U.N. General Assembly. Our display would be impossible to ignore. Will you help us make it happen? Give today to help us raise the $42,000 we need by August 21. The security situation in Darfur is reported to be relatively calm. However, minor banditry activities and car-jacking were reported in North Darfur. EL FASHER (DARFUR), Sudan, August 18, 2009 via APO. EL FASHER – The UNAMID force commander, the Nigerian general Martin Luther Agwai will hand over his duties to a new force commander Lieutenant General Patrick Nyamvumba of Rwanda. He will be the commander with effect from 1 September. The transmission of powers will take place today. The ceremony will be attended by Al Hag Atta Al Mannan on behalf of the government. Also Minni Arkuoi Minnawi, senior assistant to the president and the only rebel leader who signed the Darfur Peace Agreement, will attend. “When the Darfur Peace Agreement (DPA) was signed in 2006 less than a handful of movements were involved in the conflict. Today there are something like 30. As the movements have splintered into new factions, the prospects for a settlement have diminished. For too long these men have escaped censure, benefiting from the international community’s almost exclusive focus on the government in Khartoum to deliver peace. In fact they have been positively emboldened by it. These men with guns do not represent their peoples, the vast majority of whom yearn for peace. (…) The movements have had it too easy for too long. It is time for them to demonstrate that they are serious about peace. They must lay down their weapons and sit around the negotiating table with the government”. ‘There’s no peace for us to keep. The Darfur conflict has lasted almost as long as World War II, with the prospects of a lasting settlement looking less likely than ever”. He also blamed the lack of effectiveness of UNAMID for the lack of equipment, troops and helicopters. During his command UNAMID lost 39 people, most due to violent attacks. Amongst them were 24 troops, 9 police, 1 military observer, 1 international civilian and 4 local civilian (Source figures: UNAMID website). UNITED NATIONS (AFP) — The military commander of the UN-African Union mission in Darfur on Tuesday urged the world community to put as much pressure on the fragmented insurgency in the war-torn Sudanese region as it does on the Khartoum government. Martin Luther Agwai, force commander of the joint mission known as UNAMID, told reporters that while it is popular to "bash" the Sudanese government, the reluctance of Darfur rebels to negotiate was often forgotten. "It takes two to tango," Agwai noted. "Sometimes we forget about them (the rebels). Every day, they say they are fighting for the poor people of Darfur and yet what have they done to show even interest to go to the conference table? "I am not in any way saying that the (Khartoum) government is clean. But what I am saying is that also the other side cannot be said to be saints. So my appeal is that the pressure should be exerted on both sides." He said there were now around 30 different rebel groups involved in the conflict, compared to four when the Darfur Peace Agreement was signed in 2006. Agwai called on Darfur insurgents to unite and come to the negotiating table, which he said was the only way to achieve peace. "They will have to end on a negotiation table because militarily it's clear no side can win the war in Darfur," he said. "But if you have 15, 20 parties wanting to go to conference table to talk, nothing will come out of it." The United Nations estimates that 300,000 people have been killed and more than 2.2 million displaced since the conflict in Darfur, a region the size of France, began in February 2003. Sudan claims 10,000 have died. Since UNAMID began its operations nearly eight months ago, only a third of the 26,000 authorized troops have been deployed. Agwai said he hoped the force would reach 80 percent deployment by December and full deployment by next August. UNAMID has said it needs 18 transport helicopters and six attack helicopters which are crucial to give the force the required mobility and firepower. But no country has so far have provided them. On July 8, seven UNAMID peacekeepers were killed and 22 injured after they were ambushed by up to 200 heavily-armed gunmen. Agwai said lives could have been saved if the mission had had helicopters. "Unfortunately, we are sent to the boxing ring with our hands tied behind us," he said, referring more broadly to the lack of adequate equipment and logistical support. "But we will try kickboxing if we can't do hand boxing." Agwai, a former chief of defense staff of the Nigerian army, was appointed UNAMID force commander in September 2007 after initially turning down the job. "I was told I was going to command the largest ever UN peacekeeping force on earth," he said. "Little did I know that it's going to be on paper and not in reality." Photo: Le général Martin Luther Agwai. Source: collectifvan.org: A la Une - Le général Agwai poursuit sa visite auprès des troupes stationnées au Darfour.